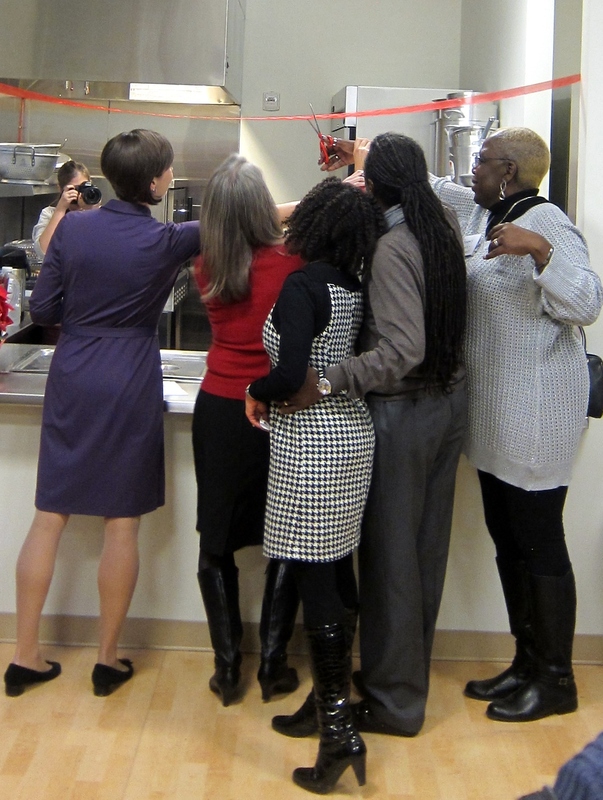 Beverly, right, cuts the ribbon at our opening ceremony last December. Beverly Sellers-Robinson, Calvary Women’s Services addiction recovery counselor, has been a long-time familiar face at Calvary. Five days a week, she wakes up at 5 am, gets dressed, and takes three buses to arrive at Calvary to lead the addiction recovery group at 7:30. Beverly has been Calvary’s addiction recovery counselor for several years, and was integral in developing Calvary’s first addiction recovery program. But Beverly’s experiences at Calvary began earlier, in the early ‘90s, when she came to Calvary seeking shelter. Beverly had been in and out of homelessness for several years already, and by the time she came to Calvary, she was motivated to move out of homelessness and get clean. After completing on off-site rehabilitation program, she returned to Calvary and got a job there as a cleaning assistant. She chuckles as she recalls, “I used to clean in my business suit because I was preparing for job interviews later that day.” Through her own hard work and the stability that Calvary provided her, she moved out of Calvary and into a supportive housing program, and opened her first savings account. A few months later, Calvary invited Beverly to join the Board of Directors. She felt excited by their invitation, but didn’t yet understand how her experiences could shape the board’s perspective. Despite her hesitation, she accepted the offer, and sat on the Board for the next four years. During that time, she began to realize her interest in a career as an addiction recovery counselor, and understood that her potential in this role was great. When she made the decision to resign from the board, she, along with Calvary’s case managers, developed the addiction recovery support program. Thanks to Beverly’s efforts, 65% of the women we’ve served in the past year have enrolled in our addiction recovery program.